Finally! Cocktails & Color is now offering an online painting membership program so people can learn at their own pace from anywhere in the world! “I’ve always wanted to be artistic but I just can’t commit to a class schedule”. “I think my kids would enjoy painting lessons but they don’t necessarily want to paint ‘kid style’ paintings”. “I’ve tried to paint at home but I spend a lot of time searching the internet for ideas and I’m not really sure what supplies I need”. IF YOU ANSWERED YES TO ANY OF THESE QUESTIONS HERE’S SOME EXCITING NEWS! 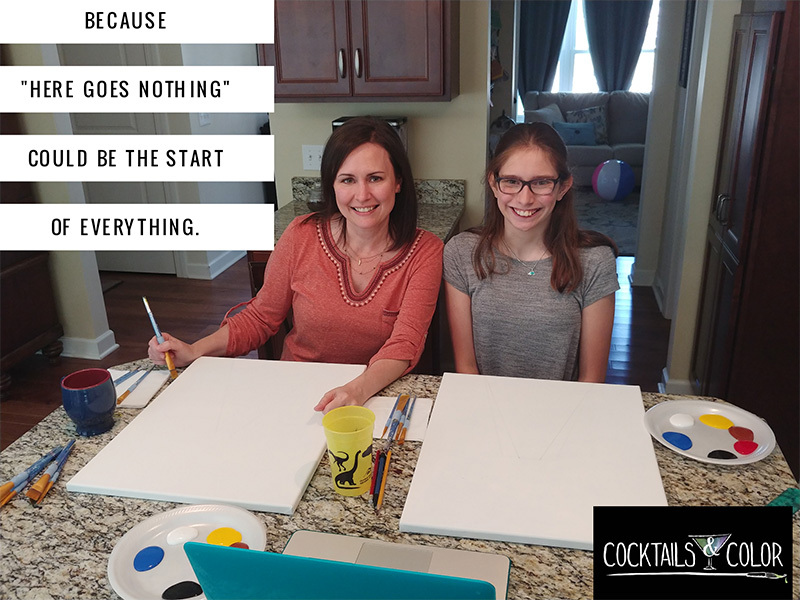 Over the past 5 years Cocktails & Color has taught thousands of people how to paint at our in-studio events, but we realize that there are many more that would like to learn from us but may not be able to because of time, distance or budget. We have created a monthly painting membership that will allow you to learn at your own pace from anywhere in the world. Each month we will bring you new paintings and new techniques that can be done by all ages and any skill level. 2 complete step by step video painting tutorials each month. These will either be pre-recorded or taught live but will then be available to re-watch at any time. As long as you are a VIP these videos will always be available to you in your library. A private Facebook community where we will share tips and tricks about that months paintings as well as fun challenges and giveaways. This will be a great place to ask the artists specific questions and share with other members as well. A complete list of supplies that you will need. Guaranteed monthly rate of $30 as long as you stay in the membership- this price will never go up even though new members will eventually pay more! Looking for the perfect present for a family member, relative, friend or co-worker? We’re offering a 3 month membership for only $90!! This limited time offer allow them to experience being a VIP (very important painter) is like, and they can purchase a monthly membership at the completion of their 3 month membership. To Purchase – email info@cocktailsandcolorerie.com and we will set you up with a gift certificate that can be entered into the website during signup. One Low Monthly Price - stay as long as you like. 2 complete step by step video painting tutorials each month. Pay for a year, and GET TWO MONTHS FREE! Membership is currently closed. Please join our waitlist to be notified of upcoming openings. Can you tell me more about your fundraisers? Cocktails & Color is a great place to have a fundraiser! Since 2013, we have helped raise over $130,000 through our fundraising efforts for different charities and organizations. Are you interested in having a fundraiser with Cocktails & Color, please learn more by visiting our Fundraiser Page. How can I contact Cocktails & Color Erie? For Erie: Please send an email to info@cocktailsandcolorerie.com for all questions or comments! We will respond within 24 hours. Cocktails & Color is so fun, I know my kids would love it. Can I sign them up too? We recommend painters be 15 and older for our public events. If a C & C event is held in a bar or restaurant that serves alcohol it is not permitted for you bring your own alcohol. If an event takes place at a venue that does not serve alcohol we will mention that in the class description and allow you to bring your own. Your events sell out so quickly! Woo hoo!! That’s a great thing and we’re doing everything we can to keep more events coming so more people can continue to paint with us. The new calendar is released to the website the 20th of each month. If there is a painting you would like to paint, you can put together a private party of your own. Check out the “Private Events” page for more info. Will Cocktails & Color come to my house for a Private Event? We do not hold events in people’s homes or in outside venues. At each event we strive to have the best possible seating, lighting, sound, etc. and that is not always possible when we can not control the surroundings. Another large part of C&C is that we LOVE bringing business to local bars and restaurants! I see there are seats open in a private event, can I sign up? A private event is a private party scheduled by one person who then invites their friends to the event. The “open seats” are only open to those who have been invited by the host. Paintings to be painted during private events are not posted on the website to discourage the general public from signing up. If you were asked to attend a private event, the person inviting you will have a picture of what you will be painting and can share that with you. The event I want is full, should I put my name on the wait list? Our website is automatically set up to send an email to the next person on the wait list if someone cancels. The wait list is also a good way for us to gauge how popular a certain class is, sometimes convincing us to repeat it. Cocktails & Color is an entertainment event much like a concert, dinner theater or movie theater. We do allow cancelations or reschedules unlike the above but we do require a 48 hour notice.If you must cancel, please do so through email. This provides us the opportunity to fill the space. We will provide a full refund or credit for another class with 48 hours notice. We will charge the event fee for reservations not cancelled 48 hours in advance. Want to join but missed out on an opening? Join our wait list and be the first to be notified when we open our VIP membership up again.